While Barack Obama’s re-election was welcomed in Mexico, many believe the legalization of marijuana in Colorado and Washington may have more of a direct impact south of the border. Speaking on Mexican radio, the head of President-elect Enrique Peña Nieto’s transition team said on Wednesday that the incoming administration would reconsider its anti-legalization stance in light of the developments in the United States. Although the U.S. federal government could yet intervene in an attempt to block the amendments – which contravene federal law – this unprecedented development could eventually pave the way for nationwide legalization or decriminalization of recreational marijuana use. In recent years, legalization has been touted by a number of former-presidents across Latin America, including Mexico’s Ernesto Zedillo and Vicente Fox, as a means of making progress in the war on drugs. A report published by the Mexican Competitiveness Institute (IMC) last week estimated that Mexican drug cartels currently earn around two billion dollars a year from smuggling marijuana into the United States. Carefully cultivated U.S.-grown marijuana tends to be more potent and desirable than its Mexican counterpart, meaning legalization would markedly diminish the market for Mexican produce north of the border. While the trade in stronger drugs such as cocaine, heroin and crystal meth would remain unaffected, the IMC suggested the new laws in Colorado and Washington would cut the cartels’ total earnings by around 23 percent. Although Mexico was never mentioned during the presidential debates, Obama’s victory over Mitt Romney on Tuesday would not have been possible without the support of millions of Mexican-American and Latino voters. Obama won just 39 percent of the white vote and was heavily reliant upon support from ethnic minorities. He claimed 71 percent of support from Latino voters, who made up 10 percent of the electorate, while Romney was backed by just 27 percent. Despite drawing criticism for not doing more for Latinos during his first term, the president has not only retained, but actually gained popularity since 2008, when he won 67 percent of the Latino vote, to John McCain’s 31 percent. The United States is home to over 50 million Latinos, the majority of whom are Mexican. These Latinos now represent the country’s biggest ethnic minority and its fastest growing demographic group. Winning them over is becoming increasingly crucial to electoral success. 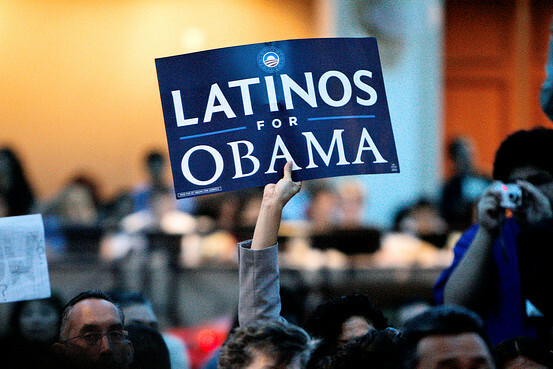 Obama’s victories in Colorado, Nevada and the crucial swing state of Florida all hinged on Latino turnout. Even in states such as Ohio and Pennsylvania – not traditionally considered Latino strongholds – exit polls suggested Latino voters played a key role in Obama’s triumphs. The Republican Party was punished by Latinos for its anti-immigrant stance, with the white, conservative Tea Party having helped alienate moderate and Latino voters by driving the GOP even further to the right. If the Republicans want to remain relevant at national level they will have to stop backing extreme anti-immigrant policies like Arizona’s controversial SB-1070 law and begin to genuinely reach out to the Latino population.